Dino & The Dolphins, LR: Martin Smith (seated), Mervyn Sykes, Denis Stewart, Bobby Dyer, Norman Sykes. Dino & The Dolphins formed in south Belfast in the mid-70s. Denis Stewart, from Finaghy, is the younger brother of Chris Stewart of Eire Apparent. Mervyn and Norman Sykes are brothers. They added a fifth member on keyboards Martin Smith during 1976-78. Smith had just returned from finishing university in England. He met the band through one John Hewitt. John Hewitt was a guitarist who'd been in bands since the early 70s. He formed a duo with budding singer-songwriter Paul Savage. Together they recorded a Peel session in June 1971 as a result of a competition called Rockatunity Knocks. Details of this period are hazy, but by 1973 they were known as Blue. Hewitt came to know Martin Smith (who also played guitar) and often jammed with him before Smith left for university in 1973. Hewitt's next significant band was called August who included Denis 'Dino' Stewart on vocals, Davy Shannon on bass and Bobby Dyer in drums. August played a few gigs locally before splitting. By 1974 Hewitt had assembled a new band called Foxy, with the return of Paul Savage on vocals, Joe Mawhinney on bass and future Tearjerkers drummer Nigel Hamilton. Foxy scored the support slot for Rory Gallagher's annual 2-nighter at the Ulster Hall that year. When Martin Smith came back to Belfast during the xmas holidays, he was invited to join Foxy for these gigs. During rehearsals Paul Savage announced he wouldn't be able to play the second gig because he had to work that night (a decision he is now astonished by), and so Foxy played one night at the Ulster Hall as a quintet with a lead singer and a second night as quartert with John and Marty providing the vocals. Their live set included several covers of west coast rock band Spirit. Eventually Foxy relocated to London but it all came to nothing. Martin Smith joined Dino & The Dolphins in August 1976. They began as a superior pop covers quartet, thanks in part to Norman Sykes understanding of chord structures and grasp of arranging cover versions. Dissatisfied playing cover versions only, they split and then reformed with the intention of playing more original material, or at least covering the stuff they really liked rather than crowd pleasers. They played a residency at the Bridge Bar in Lisburn. Their progress was hampered by a lack of transport. The band supported Frankie Miller on his Irish dates in 1977 and 1978 in Dublin and Belfast, thanks to Chris Stewart, who by then was a stalwart of Miller's backing band. Martin Smith announced his intention to quit after a particularly sloppy performance on one of these support dates at the Olympia in Dublin in 1978. Their performance the following night at the Whitla Hall in Belfast was excellent. Martin Smith left after a few more gigs. His replacement was named Eddie. Mervyn Sykes quit and was replaced by Nicky Scott (who later played bass for Van Morrison). 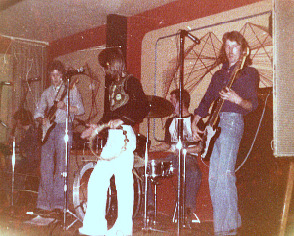 The band continued to work into 1979. They has a regular slot at The Heatherdew Tavern in Glenarm, Co Antrim during that year and famously played the Dandelion Market in Dublin on Monday 24 December 1979. I don't know the exact details of when the band split, probably sometime in 1980 but the circumstances were unusual: they were left stranded and pennyless in Holland, the victim of some bad management deal. Denis Stewart chose to stay in Holland and lived there for many years. The band never recorded though live tapes do exist. Joe Mawhinney later played in the pit orchestra at the Grand Opera House in Belfast. Martin Smith abandoned his music career and moved to work in the UK. Denis Stewart drowned in Arnhem in 2008. Paul Savage signed a record contract with John Peel's Dandelion Records. When the label folded, he chose not to pursue a career in music seriously, but still writes songs and plays gigs in the Cornwall area.